No matter how large or small an organization, the demands for security intelligence are growing. Organizations of all sizes face tremendous challenges to keep their assets secure. Most organizations use heterogeneous IT technologies and software solutions that produce a wide variety of disparate data. Such technologies and solutions include compliance and vulnerability scans, IDS/IPS alerts, asset data, access logs, and more. They monitor and track network performance, monitor and track application security, and collect and manage event logs in an attempt to meet overall IT objectives. Also, compliance mandates are on the rise, and data threats and breaches continue to challenge organizations. Security intelligence provides the means to analyze this enormous collection of data and deliver meaningful incidents to the right people. Security intelligence is not just nice to have; it is a necessity. Security intelligence is built on the same concepts that have made business intelligence an essential enterprise technology. It is the critical next step for organizations that recognize the importance of information security to their business health. Too often, the response to new security threats is a “finger in the dam” approach with a particular point technology or reactive new policies or rules. This response is in large part because a unified security program, which is based on automated analysis of unified information from across the IT infrastructure, can be costly, complex, difficult to implement, and inefficient. As a result, most organizations lack accurate threat detection and informed risk management capabilities. 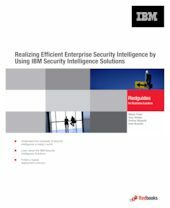 In this IBM® Redguide™ publication, you see how security intelligence addresses these shortcomings and empowers organizations from Fortune 500 companies, to mid-sized enterprises, to government agencies, to maintain comprehensive and cost-effective information security.